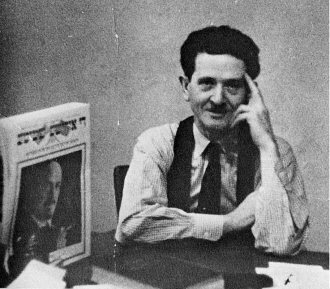 Leon Wiesenfeld (1885 - 1971) was a journalist, editor for the Yiddish language press and Jewish community leader. Jewish Life in Cleveland in the 1920s and 1930s, his memoir, was published in 1965 when he was 80 years old. Jeffrey Morris bought and scanned a copy of this hard-to-find book. To allow many more to read it we have web-published it as a .pdf document. We know of no other web-based complete, bookmarked and searchable copy of this 160-page book. Much searching has found only two mentions of Leon Wiesenfeld's memoir. Frank, a long-time Jewish journalist, writes that he had translated the book from chapters Wiesenfeld had written in Yiddish. He then, without reviewing the book, writes a long and very appreciative description of the services of his Leon Wiesenfeld. Professor Gartner, author of several books on the history of American Jewish communities, including Cleveland, in his review of Wiesenfeld's memoir, finds little of merit. As an example, Gartner finds fault in Wiesenfeld's criticism of a Jewish agency, when it also deserved much praise for playing a noble role in maintaining family allowances in the face of severe pressure to cut them sharply. Gartner's point is well taken. In the same vein, Wiesenfeld in MT. SINAI OPPOSED TO JEWISH NURSES (pp. 54-59) describes how he publicized the hospital's refusal to hire Jewish nurses and helped end this practice, but makes no mention of the hospital's many important services to the Jewish and general communities. But Wiesenfeld was not an historian. He was a journalist who needed to attract and hold readers, for each year there were fewer of them. Thus many of his essays are one-sided or strident.